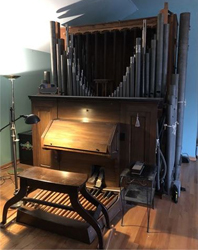 For Sale/Tax Donation: 1929 Casavant Organ in excellent condition. (See Video) The organ is in very good condition and had been kept in meticulous shape by Joseph Fitzer and Mary Gifford, two of Chicago’s most famous organists in history. The organ is unusual in that it is a small...Joseph and Mary kept it in their home on the second floor. Would be perfect for studio/home/theatre/chapel/school. This is history and priceless in my opinion. The organ is currently being stored in Pasadena. It was disassembled in February by Casavant Specialists Organ techs and documented well. I can have it assembled if someone is local or wants to visit in person.. I most importantly want it to go to a great home that appreciates it. (Would consider the following: Tax Donation, 3-5 year lend, or a purchase are all possibilities). It is a smaller organ that would be perfect for a small church, a stage or theater. ● Casavant Frere, established in 1879 Quebec, is considered among the world’s greatest Pipe Organ Companies. Casavant Organs can many cost millions of dollars,and are the preferred organ of some of the finest Cathedrals/concert halls in the world. From 1879-2014 they had made 3900 Pipe organs, only custom and handmade. ● Through happenstance, I connected with the organ tech who installed and maintained this organ. His name is Steve Drexler and he works for a the world renown organ pipe company, Berghaus in Chicago. Steve confirmed the organ is in excellent shape nd was very well maintained. ● A specialist that worked many years from Casavant disassembled the organ very carefully, catalogued the process meticulously and has properly protected everything. ● The organ currently comes with a Laukhuff blower with a noiseless box that has less air pressure as the organ is currently set up for lower volume. There are two additional Meidinger blowers if someone is interested in opening up the Casavant so it can be much louder. ● The organ is currently disassembled and properly stored in Pasadena. Please feel free to share my contact email or phone number. Thank you!